Elvin “Joe’s” life began on May 17, 1936, the son of Elvin Sr., and Letha (Jordan) Johannsen in Kansas City, Missouri. He served his country in the U.S. Army. He married Patricia Louise Latimer on January 5, 1971, in Leavenworth, Kansas. Joe had a paper route as a kid and later worked for Western Union Telegraph for 17 years delivering telegrams. One of the most honorable duties he had was delivering telegrams to the families of deceased military personnel. After 35 years he retired from Union Tank Car Company in El Dorado, working on brakes, welding and painting. His family came first and he also enjoyed fishing, woodworking, antique and garage sale shopping and storytelling (Liar’s Club!). His loving family includes his sons, Curtis Johannsen of Bullhead City, Arizona, Robert Johannsen (Robin) of Topeka, Kansas; daughters, Synthia “Sindy” Waldron (Lyle) of El Dorado, Janet Johannsen (Deborah Jacquin) of Shelby Township, Michigan; sister, Dorothy Barker of Leavenworth, Kansas; 3 grandchildren, Jamie Vaughn, Abigail Smallwood (Matt), Kaitlyn Wurtz; 1 great-grandchild, Destiny Sutton. He was preceded in death by his parents; wife, Patricia in 2007; daughter, Karen Wurtz; brother, Kenneth Johannsen; sister, Freda Talley. 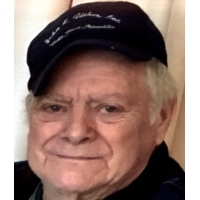 Joe passed away peacefully on Monday, April 8, 2019, having reached the age of 82 years old. His family will gather with friends on Monday, April 15, from 9-11 a.m. at Carlson Funeral Home. A graveside service will follow at 11:30 a.m. at Bella Vista Cemetery in El Dorado.